On Saturday, October 8, 2011, while hiking along the Buckeye Trail / North Country Trail through Henry County Ohio, I came upon the leg of trail that goes through the city of Napoleon along the Maumee River. Here along the River, the trail goes through Ritter Park and the boat docks area. As I hiked through there on that crystal clear autumn afternoon, the sun was bright, the sky was blue without a cloud in it, and the temperature was unseasonable but pleasantly warm- near 80 degrees! As I hiked west past the boat docks, I continued into Ritter Park, where an amazing event was taking place. 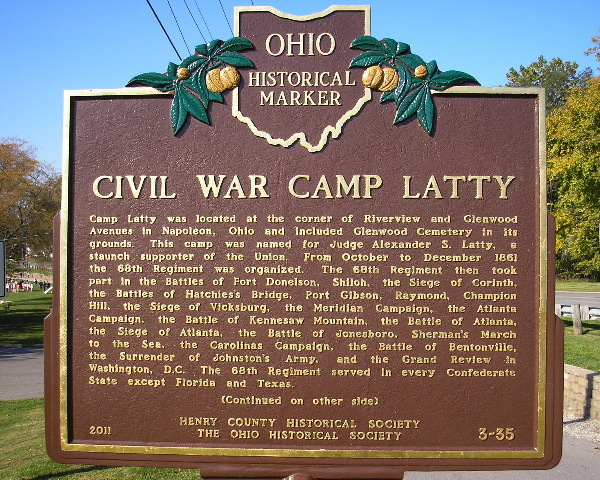 Just being unveiled and dedicated, was a brand new Historical Marker which now and hereafter will note the location and significance of "Camp Latty". 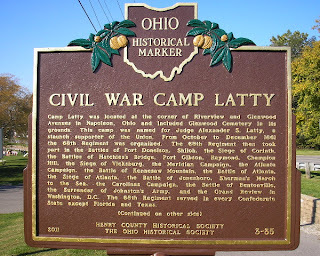 This camp was a famous Civil War camp which was used to muster the 68th Ohio Volunteer Infantry during this tragic war. The new marker tells the amazing story, which plants a curiosity in viewers to want to learn more of this famous place. This marker and great event was sponsored by the Henry County Historical Society. As I continued my hike, I came upon a number of historical reenactors, who were dressed in civil war era clothing. There were men who dressed in soldiers' attire, and women and children who tended to the homes while the soldiers were away at war. They occupied various tent structures which were authentic replications of those actually used. 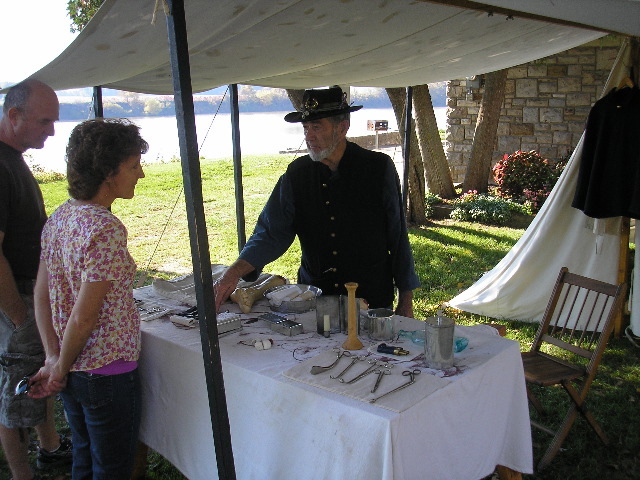 In addition, there were various demonstrations and exhibits of various aspects of what life was like during the civil war era. Complete with many accoutraments of the time, the exhibit was facinating, informative, and entertaining. It seemed as though I was a time traveler and had hiked backwards in time to a life very different that what I am used to now. I decided to end my hike for the day here in Ritter Park. As I spent some time here with the re-enactors, I enjoyed the experience and wondered about what it was like at Camp Latty. 2011 marks the first year for the 150th anniversary of the Civil War. There are many events happening around Ohio for the sesquicentennial of the Civil War. I will visit the Ohio Civil War 150 web-site to discover more Civil War events around Ohio. Until Then... see you on the trail! Be sure to click on the "Slide Show" to the right to view more photos. Also to learn more about other Ohio Civil War Events for the sesquicentennial, Click Here! ....Photos supplied by Bob Morrison and Bill Morey.